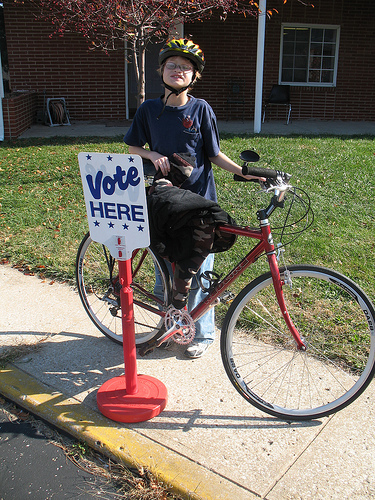 I bicycle and I vote! Prop D, the proposal to increase the state fuel tax with 70% of proceeds going to MoDOT and 30% to cities and counties, is by far the biggest transportation-related proposal on the ballot. Polling places are open 6am to 7pm on Election Day. You will need some form of ID. More info and FAQ about voting here. Find your polling place here - lists your polling place with address. Locate your local election authority's web site here - most local election authorities have local lists of candidates, ballot initiatives, and sample ballots. Put any state or federal candidate's name into the Project VoteSmart search box to find background, biographical information, and links to the candidate's web site. Eight statewide ballot issues are up for a vote on November 6th. 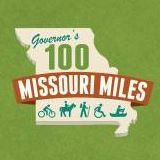 Find out details and pro/con arguments for each ballot issue on Ballotpedia and the Missouri Secretary of State web site. By far the most significant transportation-related ballot issue up for a vote Tuesday is Prop D, the proposal to increase the state fuel tax with 70% of proceeds going to MoDOT and 30% to cities and counties. Please read MoBikeFed's Prop D page for a summary of the proposal and answers to commonly-asked questions about Prop D.
Many local municipalities will have issues on the ballot. Note that these local issues most often do not show up on sample ballots generated by Ballotpedia, Vote411, and similar national election aggretation sites. Check the sample ballot on your local election authority's web site for those local issues. Or you can google location:mo cityname elections to find local election information, or google cityname sample ballot to find a sample ballot. Your sample ballot will also show any local elections, such as county council, sheriff, coroner, and assessor, that do not show up on national election information web sites. « Previous story: Prop D, Missouri fuel tax proposal on Nov 6 ballot: What is it? What does it do for bicycling and walking?